The RP Photonics Buyer's Guide contains 12 suppliers for dispersive mirrors. Due to its high flexibility, the powerful software RP Coating is well suited for designing a wide range of dispersive mirrors – for example, in the form of chirped mirrors. Dispersive mirrors are mirrors – usually a kind of laser mirrors – which provide some amount of chromatic dispersion. They can be used for dispersion compensation within a laser resonator or for the compression of ultrashort pulses, for example, or for other applications in femtosecond laser optics and optical signal processing. Some simple designs are essentially realizing a Gires–Tournois interferometer, where the chromatic dispersion essentially results from interference effects at an off-resonant optical resonator. It is possible to obtain a large amount of chromatic dispersion (many thousands of fs2) of any sign, but only with a limited optical bandwidth. The higher the amount of chromatic dispersion, the more stringent is the limit for the optical bandwidth. A totally different operation principle is that of the chirped mirror, where the optical penetration depth is wavelength-dependent. According to a very simplified picture, the resulting chromatic dispersion can be explained as resulting from a wavelength-dependent path length. With proper optimization and precise growth of the dielectric structure, ultra broadband mirrors e.g. for octave-spanning titanium–sapphire lasers can be produced. 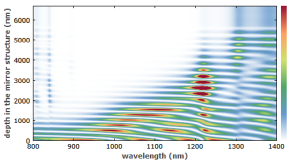 Apart from the amount of chromatic dispersion in the bandwidth, it is often important to achieve a high precision of the whole spectral dispersion profile. For example, one may use such mirrors for compensating even higher-order chromatic dispersion in the resonator of a mode-locked laser. Usually, dispersive mirrors are highly reflecting. In case that there is any significant transmission, the chromatic dispersion for the transmitted light is generally totally different from the chromatic dispersion for the reflected light. Dispersive mirrors usually exhibit higher parasitic power losses than ordinary laser mirrors. Compared with ordinary highly reflecting laser mirrors, which are generally designed as Bragg mirrors, dispersive mirrors exhibit tentatively higher parasitic losses (i.e., a somewhat lower reflectivity) and the lower optical damage threshold. This results from the substantially deeper penetration depth into the dielectric structure. (See Figure 3 of the article on chirped mirrors.) The higher parasitic losses also imply a higher degree of thermal lensing on such mirrors, if they are used for high-power laser beams. With optimized high-power dispersive mirrors, however, thermal effects can be kept on the level which is quite low compared with those at other kinds of dispersive elements, e.g. prism pairs. Key aspects for such an optimization are the minimization of parasitic losses and the use of a mirror substrate material with a low thermal expansion coefficient and a high thermal conductivity. Figure 1: Multiple passes of a laser beam at a pair of dispersive mirrors. If a simple reflection on a dispersive mirror does not provide sufficiently much chromatic dispersion, one may use multiple reflections, e.g. between two dispersive mirrors, where the two mirror surfaces are parallel to each other and non-normal incidence is used (see Figure 1). Note that the angle of incidence should not be too large, because the chromatic dispersion depends on that angle. Obviously, the total power losses and the total strength of thermal lensing scale with the number of reflections. Sometimes, a matched pair of two different dispersive mirrors is used, where the dispersion errors of both mirrors are partially compensated.